May 17th was to be a day of 'firsts' for our regular contributor Karl Alexander. 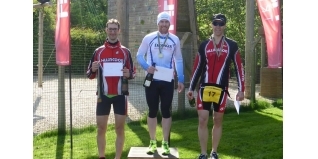 Despite top finishes and wins at middle and long distance events, race one of the 2015 Hillingdon Triathlon Series would be the first time he'd ever raced a sprint distance event. Here's how it went. My first event of 2015 was planned to be the Immortal Stourhead for the inaugural event. However, a slight administrative error [Ed - my fault! ], meant I wasn't entered and the opportunity was lost. 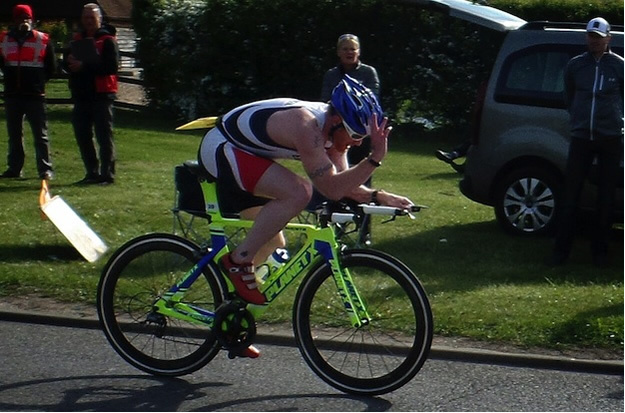 However, always keen to race, Tri247 editor John Levison offered an alternative, the Hillingdon Triathlon. Now, never actually having done a sprint distance triathlon before I was actually very nervous going into the event. Looking at some of the timings from previous years, I knew it had the potential to be hotly contested. This was compounded by the slightly differing format, a swim-run-bike format triathlon. That said, it gave me some comfort knowing that my strongest discipline would be the last and I could empty the tank if needed. 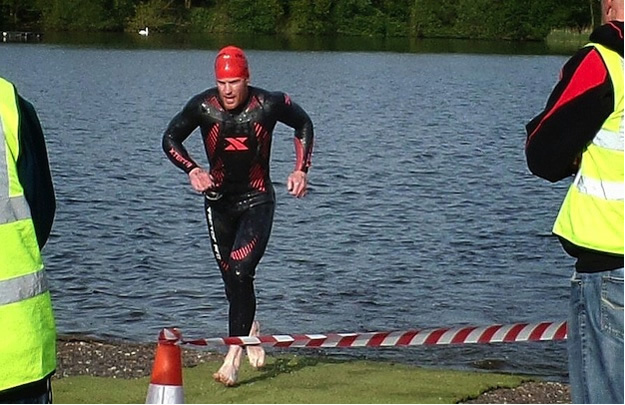 The 750m lake swim would serve as another first, my first outing in the Vortex Pro wetsuit provided by my epic sponsors XTERRA, had I been doing the Immortal I would have stuck with my Vendetta from last year. At 7:30 we were sent on our way and as usual I kept to my tried and tested format, shot from a cannon the first 200 metres then ease back into something sustainable. As I took my foot off the gas and sighted the first buoy I could see a swimmer ahead who's cannon was clearly better! It was fellow XTERRA athlete, part man but mostly fish, Jordan Sexton participating as a relay entry. How annoying is having your feet tapped? I was being drafted off and whomever was doing it was clearly unaware of their arm length or they were quicker. Either way, I eased up and moved across and through they came and with that I stayed with them to the exit and the run to transition and fourth out the water. This race. This race you are aware of is a race of firsts. My new trainers were er... new. And with the Outlaw Half in a few weeks I didn't want to ruin any training by tearing my feet up so a few seconds lost in T1 putting on some socks meant a weeks training. With the slight delay I left T1 and couldn't see how far ahead they were, the narrow entry to the venue was twisty but whilst they were out of sight they were certainly not out of mind. As I turned left on to the main road I could see the leaders about 200m ahead, and on this out-and-back 6km course I knew I'd have to go full gas. By the turn I had shut the gap to a few seconds and caught the third placed man on the road. As I approached he noticeably lifted his speed but I was running strong and comfortably. As soon as I sensed a drop in his pace I injected a little acceleration of my own. A few seconds later a furtive glance confirmed I had a good gap and I was hunting second. I ran into T2 in second place and began to feel confident that the win was within reach. All that lay ahead was 25km and Clark Schofield of the promoting club. The bike course starts with a left turn to a roundabout, essentially an out-and-back that gives you an indication of the gap you do or don't have. I’ve been riding well, and my Planet X Exocet 2 is awesome, with every pedal stroke the gap was coming down. Within three miles I caught the leader and seeing a slight rise in the road ahead put in a little dig to get a gap. I didn't look back; this wasn’t arrogance this was nerves. I kept riding hard for two miles or so and afforded myself a look. I was alone. I settled into a good tempo and kept the pace high, the Exocet 2 handling well and cutting through the wind and I was feeling good. The bike course is surprisingly undulating but on good roads, definitely a sporting course and after 1 hour 13 minutes and 17 seconds my first sprint triathlon was completed (a quick check of the online results for the past few years show this as the fastest time). First race on the year, first swim in the Vortex Pro, first race on the Exocet 2 but importantly, first win! Thanks to John at Tri247 for getting me a race, my sponsors ERDINGER Alkoholfrei, XTERRA, Planet X and Last Mile plus the marshalls and organisers of a frankly excellent event.